Service Design: Why is Service Design a hot topic today? Service Design is fast becoming a buzz word in the strategy world, but why? Let’s start by defining what it is. 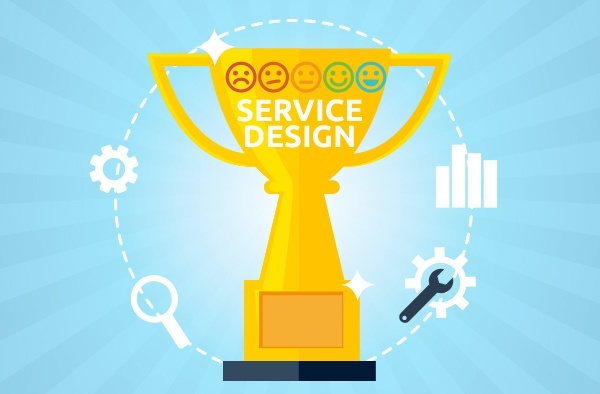 Service Design is the activity of planning and organising people, infrastructure, communication and material components of a service to improve not only the quality of the service but also the interaction between the service provider and its customers. It’s about giving value and getting results. Just as product design is a discipline where formal design methodologies and approaches are used to make say your phone and car the best they can be for your needs and your lifestyle, Service Design does the same for experiences. Service Design is strategic, holistic and collaborative and is both a creative and practical way to improve and innovate existing services and design new ones. Customer expectations are rapidly changing. The emergence of the internet and the rise of experience-focused brands such as Uber, Apple and Amazon have created a new era of value creation. Companies build value not merely by delivering a product or service anymore but through engaging experiences. In today’s modern world, customers have become more tech-savvy and have the power to research and choose between endless competitors providing similar services. As technology and customer needs change, so too must service providers. Cultural changes and shifts in the business environment in recent years has increased the demand to deliver exceptional experiences. After the credit crunch, consumers have become more and more discerning about where they spend their money, choosing businesses that offer satisfying and customised experiences. In response, service design is becoming key in the marketing and strategy department of many service providers. Service Design can be used to bridge the gaps between what the organisation can do and what customers need and want. Service Design improves customer experience, increases brand awareness and loyalty and improves operational performance and efficiency. Service Design is about putting people at the centre of the design process and making experiences deliver what people actually want and need rather than what a service or organisation thinks they want and need. It’s about customising the wheel, not reinventing it. Empathy is critical too. When organisationses are able to step into their customers’ shoes and experience their own service through their customers’ eyes, they are able to truly understand what their customers are going through, and how to make sure that experience is the best it can be. Services like AirBnB, Uber, Apple and Amazon have created a new era of value creation. Their use of transparency, speed, choice, customisation and feedback have resulted in their enormous success. with startling effect. Such experiences and values are becoming expected in all other services too. And that’s what Service Design can help with. Customer interactions with services are changing and applying innovation, in the design of such services, is imperative to meet the needs of customers today, tomorrow and in the future. The result will be an experience that builds lasting customer relationships. In a busy market place, the best way you can make your organisation stand out is through customer satisfaction. Service Design guides organisations to find out who their users are, what their needs are and then improves the service accordingly. The principles of service design can be applied across all industries from health, government, education, retail and more. Services need to be up to date with their current customer expectations, leveraging the available technology and delivering transparency so they can be trusted. Consumers today expect more so services need to be able to reflect that.